Results of the survey will be presented and discussed at the IBS Annual Meeting on January 15, 2010 in Harrisburg, PA. Details of the meeting, and the survey results, will be posted on the IBS web site within 48 hours of the meeting’s conclusion. The primary purpose for the surveys is determine how we can grow benchrest shooting. We realize there are a lot of shooters that were once into the sport but have drifted away. Why? Have they found something else, or are we doing something wrong? The second group we want to reach are serious shooters that do not consider themselves to be benchresters. How do they view us? Are they interested in learning more? How can we help? By design, the surveys contains some quite provocative and controversial questions. Some questions seek opinions on caliber-neutral scoring in Score and whether the two benchrest organizations should be combined. We even tackle the age-old questions about competitions for factory rifles and whether there should be shooter classifications. I have been thinking a lot about benchrest in comparison to the other shooting disciplines. In doing so, it is nearly impossible to avoid buzz words, such as “elite”, “ultimate” and “cutting edge”. 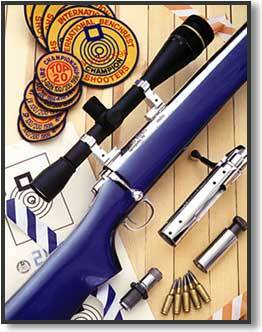 Simply put, benchrest shooting CAN be described as such, because that is what we do. If that turns off some, so be it. The rifles that sit on the rests aimed at IBS or NBRSA targets from 100 to 1000 yards ARE the most accurate on the planet. Note I did not say “some of the most accurate”. Probably the most challenging part of our game is there is NO room for error. A group or aggregate that measures, say .270″ is a far cry from a .170″. Point out a .10″ tick mark on a ruler to the average Joe and tell him that is the distance that represents the difference between great and average. I think the very nature of our discipline appeals to a particular type of individual. We are trying to place each shot in the same hole or on top of a small ‘x’. It is hard to dabble in benchrest. It is a bit of an “all or nothing” game. Selling our sport can be a little difficult. Some of the uninitiated think it is either too complex or too easy (see the comments on this benchrest video on Youtube if you want to lose your lunch). I don’t mind that we are a “niche” sport, but we need to be a critical mass to make sure the normal weekend shoots have healthy numbers. Interestingly, most of the really large shoots, such as both Nationals and the Super Shoot have held their own in recent years. So, maybe the economy does play into the number of shoots that a person attends. There is a question to that effect in the survey. Recently, I had a call from a fellow that is building a sophisticated range here in the east. He was not a benchrest shooter, but wanted information on what we needed so that he can host registered matches. He directly told me that benchrest was important because that is where all the accuracy improvements were coming from and he felt his range needed to cater to our discipline. Enough said. Share the post "IBS Invites Shooter Participation in New Online Surveys"
Kestrel has teamed with Horus Vision to produce a new Kestrel Weather Meter with integrated ballistics software. Previously, shooters would need to obtain environmental data from a Kestrel meter and then input that data into a PDA loaded with Horus ATrag ballistics software. Now, the Kestrel Ballistics Weather Tracker with Horus ATrag software contains all of the necessary data and solutions in one Kestrel device, which is IP67 waterproof and MIL-STD-810F rugged. MSRP for the Kestrel with Horus Ballistics is $619.00 (non-Bluetooth). For a discussion of the new Kestrels with Horus software, read this Sniper’s Hide Forum THREAD. Q: Which Kestrel Meters will be available with Horus ATrag ballistics software? A: The Kestrel 4500 NV series will be available with Horus Vision ballistics. The Kestrel 4500 is the only model to give wind direction, which is important for long-range shooting. For more money, you can order a model with Bluetooth capability that allows wireless data transfer to a laptop or PDA. Q: When will the Kestrel/Horus be for sale and how much will it cost? Q: Can I upgrade my current unit to include Horus Vision software? A: No. The Kestrel with Horus Vision ATrag software was specially designed and built to support the integrated ballistics solutions along with the Kestrel environmental data capturing capability. This is not just a software upgrade. Kestrel does offer a Customer Care Discount program where you may trade in your current Kestrel for credit towards the new Kestrel Weather Tracker with Horus Ballistics software. Share the post "Kestrel Weather Meter with Built-in Horus Ballistics Software"